I’m always up for a new anime especially ones that are not well know but still very good. I saw this anime a few years ago and to this day still enjoy watching it once in a while. The Girl Who Leapt Through Time originated as a short fiction novel by Yasutaka Tsutsui and was published in 1967. The book title is a bit different than what it is on the movie. It was called The Girl Who Runs Through Time. I had no idea that this story was that old until I started browsing online. This timeless tale has had several adaptations as a manga, a tv show and as movies. The Girl Who Leapt Through Time is a Madhouse film that was released in 2006 and produced by Takashi Watanabe and Yuichiro Saito. It was directed by Mamoru Hosoda who also directed episodes in shows like One Piece and Digimon Adventure. The screenplay was written by Satoko Okudera which won Best Screenplay at the Tokyo Anime Awards for The Girl Who Leapt Through Time. This isn’t the only award, however. The Girl Who Leapt Through Time won Best Animated Film at the Sitges Film Festival. At the Japan Academy Prize it won Animation of the Year. The film won further awards at the Tokyo Anime Awards including Animation of the Year, Director Award, Best Original Story/Work, Achievement in Art Direction, and Character Design Award. Emily Hirst, who voiced the main character, won Best Performance in a Voice-Over Role. At the 61st Annual Mainichi Film Awards, it won the Animation Grand Award. 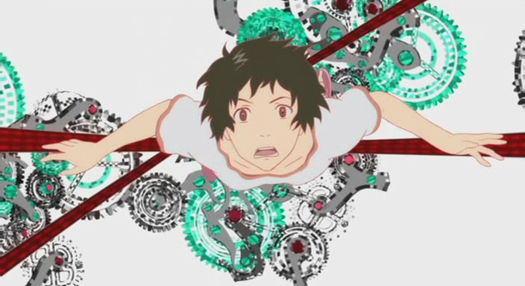 The film got the Grand Prize in animation at the Japan Media Arts Festival. At the 31st Annecy International Animated Film Festival in France, it won the Special Distinction for a Feature Film. In Manila, Philippines, during the 9th Cinemanila International Film Festival, the screening of the film was packed. This is quite an impressive list. The story revolves around three high school students, Makoto Konno, Chiaki Mamiya and Kosuke Tsuda who always play baseball after school. One day when doing some after school chores, Makoto falls on a walnut. As she is falling, her elbow hits the walnut on her upper arm and she gains the ability to travel through time. She takes this occurrence lightly and uses her ability to travel back in time as many times as she wants, thinking nothing of it. She soon learns that time travel is not as simple as it seems. Every time I watch this movie my appreciation grows. It’s a touching tale that grabs your attention right away. The fact that the main character can time travel is a plus for me. I’ve always been a fan of science fiction. At first glance this may seem like a simple story but it has much more depth when you look closer. The friendship between Makoto, Chiaki and Kosuke is admirable. They’ve always been friends and I’ve envied friendships like these. Since I was little I’ve had my sister to hang out with so I didn’t make any deep friendships at a young age. There is a flashback in one of the scenes that shows the 3 of them being there for each other since they were younger. Also, you see Makoto grow throughout the movie from a thoughtless child without ambition to a mature young lady. The action of Makoto running and leaping into the air to time leap is an interesting concept. In a way it symbolizes Makoto running from life’s responsibilities and wanting to be a kid forever. Her carelessness shows in her performance in school. At the start of the film she doesn’t seem to care about her future and has not thought about it much. Chiaki is similar to Makoto in that he is always late to class and his grades aren’t very good. Kosuke is the one who always keeps them in line and reminds them that they have to think about their future eventually. The film progresses nicely with bits of humor here and there to keep the mood light. Whenever Makoto travels and she arrives at her destination, it’s funny when she ends up at a different spot than where she was originally. Everyone gets confused and she just makes up a completely ridiculous reason as to how she ended up there in the first place. Many times she just says, “I fell.” It cracks me up every time. Aside from the story, the artwork in this film is really beautiful. Each and every scene has vibrant colors and so much detail. It’s no wonder that the film won the Achievement in Art Direction Award. The whole movie is just visually pleasing. I liked how they decided to illustrate her time traveling with the backdrop filled with numbers and gears from a clock. The voice acting is great and fit each of the main characters’ personality. Emily Hirst did an amazing job with Makoto. I watched the English dubbed version because I can immerse myself fully when I don’t have to read subtitles. I was moved by the music in this film which were all composed by Kiyoshi Yoshida. I especially liked the opening theme and a song called Garnet. You can already tell from this review that I adore this film. If I haven’t already said it, which I probably have, I love this movie. It’s fantastic and I think that everyone should either own this film or have rented it. I highly recommend it. I guarantee that you won’t be disappointed. The thing about movies that aren’t as popular is that when they are good, they’re really special. Below is a video review I had done of this movie 3 years ago. I loved the movie so much that I was compelled to make a video about it. My LIKE button isn’t working…. anyway, LIKED ! 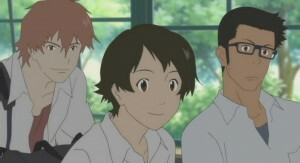 The Girl Who Leapt Through Time is wonderful, and I agree that the artwork is beautiful. I particularly enjoyed the slow motion/frozen shots. 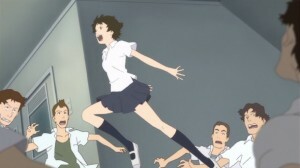 Makoto is such a likeable character, and I loved the parts where she leapt, and crashed – so funny! If you haven’t seen it, you should check out Steins;Gate, which is an amazing time travel anime series. There’s an interesting post on the Manga anime blog here which looks at The Girl Who Leapt Through time vs Steins;Gate if you’d like to know more!